Day of the Dead is a gambling machine by IGT that is based on a tradition that is celebrated as a holiday in Mexico. Many Latin American cultures celebrate this event when people honour the memories of loved ones who passed away. This tradition, known as Dia de Muertos, goes on for three days, from 31st October to 2nd November which coincides with the Hallowmas ceremony of Christians. On such a day marigold, beverages, food and sugar skulls are found, and these are part of this title as well. These icons of Day of the Dead are part of this themed game which is not surprising; as people dress up in scary costumes like skeletons or witches, these are also found on the reels of this game. It is similar to Halloween tradition as well when children dress in costumes and knock on doors, looking for treats. IGT has designed online Day of the Dead slot machine on the MultiWay Xtra wagering system. Launched in the year 2013 this particular title has a hexagonal layout and offers 720 different ways of winning. The graphics are stunning, and so are the unique features that unravel as the reels are spun. Audio effects are also as per the theme with Mariachi music added to the background. The scene comprises of upbeat music in trumpets and guitar as well as colourful visuals. 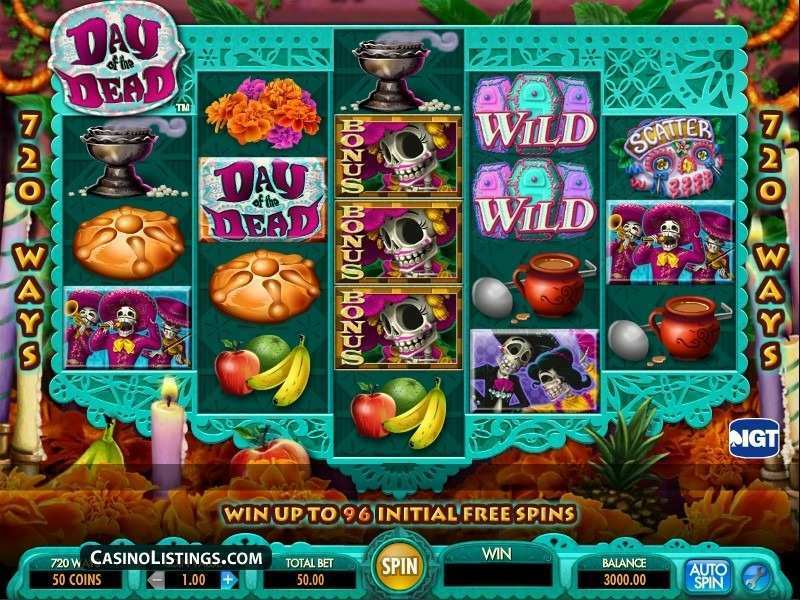 This title of IGT will appeal due to its colourful theme and music; you can play Day of the Dead slot online for free in any online casino hosting the title. The free version is conceived for fun purposes and often can be played with no deposit bonuses in free slots no download category. The slot machine Day of the Dead can also be tried with real money at licensed online casinos. You can form an account at an online casino where IGT titles are available and deposit the minimum required.